Gage Glass supplies a wide array of devices and components for regulating and controlling the flow of fluids and gases all types of tanks and environments. With the right gauge or observation port installed, you can monitor the environment or activity of almost any container, even when temperatures exceed 1,000 degrees or more. Threaded blast gate valves are among the strongest and most resilient observation and regulation devices, allowing the viewer or operator to safely work in the harshest environments, making them an ideal option for regulating or inspecting furnaces and other high-temperature environments. Gage Glass supplies blast gate valves in a variety of configurations, including threaded and flanged gates, as well as gates flanged and threaded on opposite sides. By choosing the right glass type, body construction, size and design, you can easily monitor or regulate the environment of any type of equipment or environment. The threaded blast gate valves are similar to flanged blast gate valves in construction and durability, but use a threaded opening. 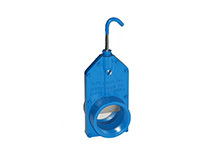 Available in 11 different sizes varying between 1 inch and 10 inches, as well as configuration options for glass type and a stainless steel or carbon steel body, threaded blast gate valves make it easy to regular air or fluid flow in a wide range of applications. Click on the threaded blast gate valve in the size that best suits your equipment and application to see the full range of configuration options available on each model. Choose the glass type and body type that is best for you and place an order online now or call Gage Glass at 800-780-3776 to get a quote or for help selecting the right product for your operation.